Once again, the post for today is not the one I originally planned. The Holy Spirit speaks and so I listen. Being an emotionally sensitive being, when the Spirit fills me, I am often overwhelmed and am unable to keep the tears at bay. For several years, this was the reason I had distanced myself from all things spiritual, keeping them at arm's length. Yet, I know one day, when I was able to face the onslaught of feeling, I would return. I believed in God, I believed in the power of prayer, and I believed in eternal families. However, I did not act. I feared I would lose control of my delicate emotions when the Spirit beckoned. More than anything, I did not want that. I feared man more than I feared God. Despite my fear, I never stopped believing. My heart knew the truth which could not be denied. Bit by bit, I allowed myself to move closer to the gospel. As my confidence grew, so did my desire to become what God wanted me to be. But those bothersome tears! They sprung up at the most inopportune moments, the latest during the last verse of my favorite hymn - "I Know That My Redeemer Lives" - as I sang for the congregation of my ward. I searched for a solution to keep the tears at bay. The only option I could find was to once again distance myself from the church and all I believed. That solution was and is unacceptable. How could I again deny what I've come to know as truth? Then my uncle died and with his death came further spiritual enlightenment. Not only was my belief in eternal life strengthened tenfold, my desire to follow my uncle's inspiring example of service and Christlike fears pushed my doubts aside. In the aftermath of my grief, as my life returned to a semblance of normal and I accepted the truth of my uncle's passing, an inkling of a thought tickled my mind. I pushed it away, dismissing it as nothing more than a passing fancy. Days later, it returned, stronger and more insistent and I knew it was the answer to my prayer. Just as my tears over the loss of my uncle had decreased and eventually subsided, the same would happen the more I embraced the constant presence of the Holy Spirit in my life. 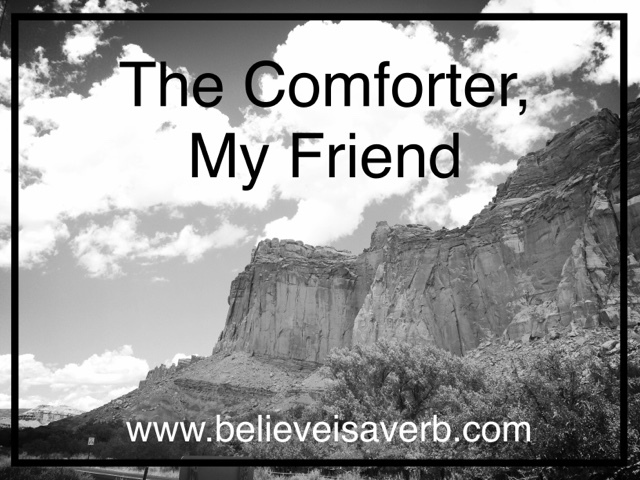 There's a reason the Holy Ghost is called the Comforter, for his continued influence in my life will bring peace to my soul and I will become attuned to the emotions such a hallowed presence invokes. The tears that escape and run down my cheeks will not be anything to fear, but will bear witness of the depth of my love for Christ and His gospel. Those things I feared most will become my greatest testament of God's word. For I know that my Redeemer lives. By accepting His Holy Spirit's presence, I will become a beson of His everlasting light; for a candle set upon a hill cannot be hid. And if I cry, so be it. For God knows my heart and that's what matters most. 26. But the Comforter, which is the Holy Ghost, whom the Father will send in my name, he shall teach you all things and bring all things to your remembrance, whatsoever I have said unto you.